According to Wikipedia, a beauty pageant or beauty contest is a competition that mainly focuses on the physical beauty of its contestants, although such contests also incorporate personality, intelligence, talent, and answers to judges’ questions as judged criteria. The phrase almost invariably refers only to contest for women and girls; similar events for men or boys are called by other names and are more likely to be bodybuilding contests. Winners of beauty contests are often called beauty queens. Possible awards include titles, tiaras or crowns, sashes, savings bonds, and cash prizes. 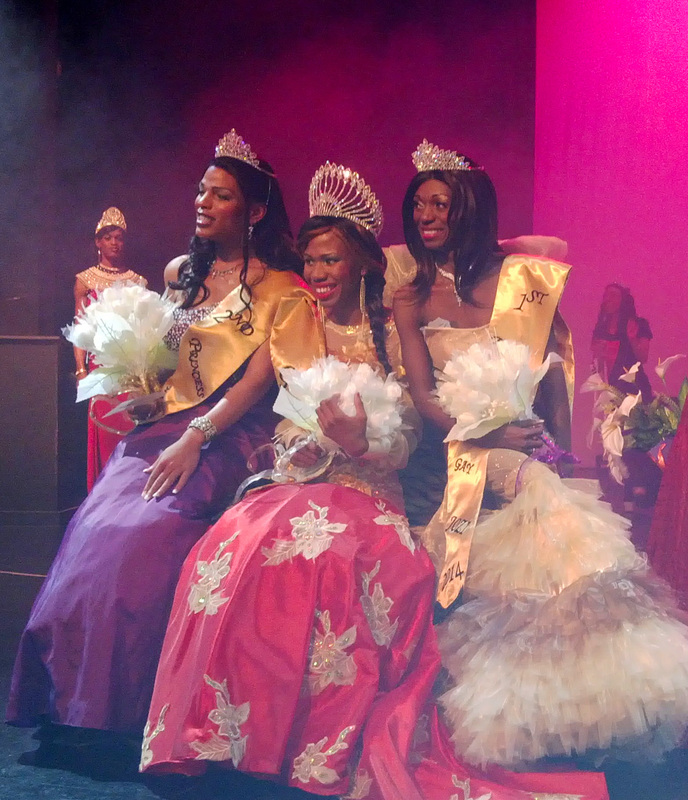 Miss Tee franked by her princesses when she won Miss Gay Jozi on the 17th May 2014… Photo by Smanga Shange. I decided to discover what the newly crowned Miss Gay Jozi 2014, Miss Tee Menu (19) from Daveyton, Benoni when did she fall in-love with entering beauty pageants. I wanted to know what is her understanding with the word beauty pageant and her journey since she started entering the beauty contest samongst other things. For the first time in history in Johannesburg, Gauteng. Zsa-Zsa Whitney of Club Simply Blue decided to launch a beauty contest for drag queens and transwomen Miss Gay Jozi last year, 2013. The question of why transwomen should partake in a “Miss Gay” pageant is a topic for another day. The second year of Miss Gay Jozi saw a young transwoman from Daveyton takes the tittle home with the biggest cash prize any other drag beauty queen in Johannesburg ever won. Here is what the beauty queen had to say on our little conversation. I’m a hairstylist and a designer, and I am currently working with IBQY5 which is a group of 5 young women, 4 Lesbians and 1 transwoman born-frees working on documenting other LGBTI born-frees in the townships. I live with my mother, my elder brother Tumelo Menu, younger brother Tebogo Menu and Reneilwe Menu who is my younger sister. I play netball on my spare time and help my mother with designs of the dresses I usually wear at beauty pageants and other events I attend. My first pageant was in September 2013 and it was Miss Gay Daveyton. Winning Miss Jozi meant I’ve reached another level on my pageants journey and that means I’m getting closer to what I want to achieve. No was my biggest competition at Miss Gay Jozi because I believed I had to bring out the best in me and I did just that hence the win. Hoo! My challenges at Miss Gay Jozi were the fact I left one shoe and left my wigs at home and that meant I had to work with what I had. I don’t know what went through my mind when I won Miss Gay Jozi, I was too excited. I didn’t expect to win, I thought I had chances of winning but having not attended the rehearsals I wasn’t sure anymore. My prizes as the overall winner of Miss Gay Jozi, I received R6000.00 cash prize, a designer dress, a watch, from NWJ, CD hamper worth R6000.00, Club Simply Blue bar voucher. Miss Uthingo 2013, Miss Simply Bue 2013. 2nd Princess and now Miss Gay Jozi 2014. During my reign I want to make this tittle bigger than it is now, I want to challenge the next queen to work even harder than I did. More visibility for such beauty pageants is also my ultimate goal. My dream in life is to be one of the most inspirational transwoman in in the globe. What is the biggest mistake you have done in your life? Not believing in myself yet people knew I could achieve more than I thought I could. Both, I’ve always wanted to be there! Shopping in Dubai and with New York, I just want to see the place! Motivational Speaking, I just feel there are people who needs the motivation I got from the people around me. iPad, why should I carry a camera where the iPad has both. This entry was posted in Cash Prize, First transwoman from Daveyton to win Miss Gay Jozi, Gender expression, iBQY by Inkanyiso, Participation, Perception, Photo album, Prize, Sashes, Sexuality, Sharing knowledge, Thabo Menu, Tiaras, Young Transwoman win Miss Gay Jozi and tagged 2014 Miss Gay Jozi, Act, activism, Activists, Another approach is possible, Articles, Arts, Beauty contests, Beauty queens, Competition, Daveyton, Discipline, Drum cover, Drum magazine from South Africa, Family support, Fashion, Intelligence, Johannesburg, Life, Love, township, transgender, We Care, We were there, Winner, Writing is a Right, Yaya Mavundla. Bookmark the permalink. Yaya Mavundla! We talk about you all the time at the office. Never met a transwomen in South Africa coming from the rural area even who is so smart and dedicated to what she does. You are beyond good, remember when you did research for us at Urban Brew? You are perfect example of the saying “You do not need a degree for what you good at” Andre. Andre I will come see you soon. Pass my regards to Marvin.